Mistakes, abuse & VAR: What are the pressures like on a Premier League referee? "It hurts a lot. It is so far from reality to think a referee drives home singing along to music after getting a big decision wrong in the Premier League." The pressure on Premier League referees has never been greater, with cameras focusing on every move, pundits questioning decisions and an army of fans condemning each mistake on social media. And that's before the brunt of criticism from the stands has abated. 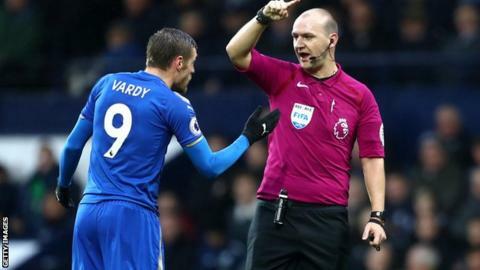 BBC Sport speaks to former Premier League referee Bobby Madley and 1998 World Cup final assistant referee Mark Warren to find out what things are really like for officials at the highest levels of the game and how they cope with abuse they receive. "Refereeing can be a lonely place sometimes," says Madley, who officiated 19 Premier League matches last season before leaving the UK to live in Norway. The 33-year-old, now resuming his career from the lower reaches of Norwegian football, had taken charge of more than 100 top-flight games before his departure. And he says that while little has changed on the pitch since he graduated to the select group of referees in 2013, interest off it has made things tougher. "I don't think pressure from players and managers has increased because you can never please 22 people," he says. "As a referee you understand that. You also understand people's livelihoods are at stake, and although one decision doesn't get somebody sacked or relegated it can heavily contribute. "Scrutiny from the media has increased a hell of a lot. There are more cameras, the quality is clearer, the technology is better, and people want more information. They don't just want highlights of goals any more. "We work with sports psychologists and if you make a decision sometimes you get a gut feeling you might have made a mistake. You just understand the reaction from players, managers, the crowd and think: 'I might have got this wrong.'" While pressure in football is felt from the boardroom down to players, Warren, who describes the 1998 World Cup final as "the ultimate", says the mental strain on officials is "severe". "You can feel it, no doubt about it, especially on the biggest stages," the 59-year-old adds. "You are so absorbed on one thing you try to detach yourself from everything else." Refereeing mistakes happen, even at the highest level. Howard Webb famously failed to send off Netherlands midfielder Nigel de Jong for a challenge resembling a kung-fu kick on Spain's Xabi Alonso in the opening minutes of the 2010 World Cup final. In the 2006 tournament, fellow English referee Graham Poll booked Croatia defender Josip Simunic three times against Australia before eventually sending him off. There have also been plenty of cases of mistaken identity - when sending players off - 'ghost goals' and controversial penalty decisions. And offside calls are also a regular talking point, with changes to rules making the life of an official even more "demanding", according to Warren. "The lawmakers wanted the game to be more open but as an assistant you take your line off defenders - so if a forward is 10 yards past them but not active until the second phase you've got a real job to get the decision right," he says. Madley says big errors often produce an emotional fallout that "hurts a lot". "It is so far from reality and totally untrue to think a referee just drives home singing along to music after getting a big decision wrong in the Premier League," he adds. "Your professional reputation is hurt but I'm hurt as a person as well. I don't want to make wrong decisions or have a negative impact. "The stronger referees put it to one side and think about the next decision because there is a snowball effect. If you are not concentrating 100% the danger is you get the next one wrong and suddenly you panic. Two wrong decisions can easily turn into three." In an attempt to alleviate that problem the Professional Game Match Officials Limited (PGMOL) has used sports psychologists and has also brought in Scott Ward from Ernst & Young's personal performance programme to deliver 'wellbeing and transition' sessions to referees. Ward, who is a former Luton goalkeeper from a family of footballers, and has first-hand experience of the pressures of sport, said: "This area is of huge importance in elite sport. "By creating a better understanding around wellbeing and personal development we want to impact positively on statistics and stories we see of people facing mental trauma." Madley correctly dismissed three players on his Premier League debut in West Brom's 3-0 win at Southampton in April 2013. It is not always plain sailing though. Criticism of referees by managers and former colleagues turned pundits often runs alongside verbal abuse from the terraces and negative comments posted on social media. "Premier League referees are not allowed to have social media accounts to protect them from attacks," Madley says. "Now I'm outside that environment I've read things on Twitter and Facebook about myself and others which is horrendous. "I understand if you make a wrong decision it makes you the worst referee in the world. But when people say, 'I hope his house is burned down with his family inside', let's be realistic. It's a mistake on a football pitch, so there is good psychological reason a referee would not want social media. "The support network provided by PGMOL is really strong. Work with sports psychologists is very individual and they have coaches who are former top-level referees who understand the problems. "Referees are protected in terms of what goes into the media - but the most valuable support I had was picking up the phone to other guys in the group." Those psychological pep talks often came during the solitude of long drives back home from Premier League matches, with officials barred from travelling together. "You can go home and moan about things, speak to your dad or friends about what has happened - but they've never experienced what it's like to stand in the middle and take that pressure," Madley adds. "So I would stick hands-free on my phone on and speak to six or seven other referees on their way home about how things had gone. I could bounce off them and the mentality of the group was very supportive. It was like self-psychology, which was massively beneficial." What impact will VAR have? The video assistant referee system (VAR) will make its debut in the Premier League next season, with the technology having already been used at the 2018 World Cup, in the Champions League and in the FA Cup. VAR is designed to reduce important mistakes and will be used to look at goals, penalties, straight red cards and cases of mistaken identity. But that does not mean pressure on referees will be eliminated. "It is still down to human interpretation," Madley says. "As much as there will be a lot more correct decisions, and correctly overturned ones, you will still see some element of human error. "The Paris St-Germain v Manchester United game is a really good example." United went through in the Champions League last-16 tie when Diogo Dalot's last-minute shot struck the arm of PSG defender Presnel Kimpembe and was given as a spot-kick using VAR. "If you had a room full of referees, 50% would have said penalty and 50% would say no penalty," adds Madley. "Therefore you have a situation where it is pot luck which of those referees is sitting in the VAR room. What you will see next year in the Premier League is a lot of decisions being made by VAR when it's needed. "If it needs overturning or supporting the VAR will say 'this is the outcome' and the referee will trust that because the amount of pressure on a referee at the side of a pitch reviewing a decision is huge. "Martin Atkinson's decision over the Victor Lindelof red card in the Wolves v Manchester United match is a good example. Chris Kavanagh [in the VAR room] gives him the information it is only a yellow, he takes it and the correct decision is reached. "If Martin goes to the side of the pitch and believes it is still a red card then there's a lot of pressure building - because that creates an obvious rift between the two officials."